A T-6 aircraft crashed shortly after takeoff from Naval Air Station Kingsville, killing both people aboard.Photo: Navy photo by Kevin Clarke. 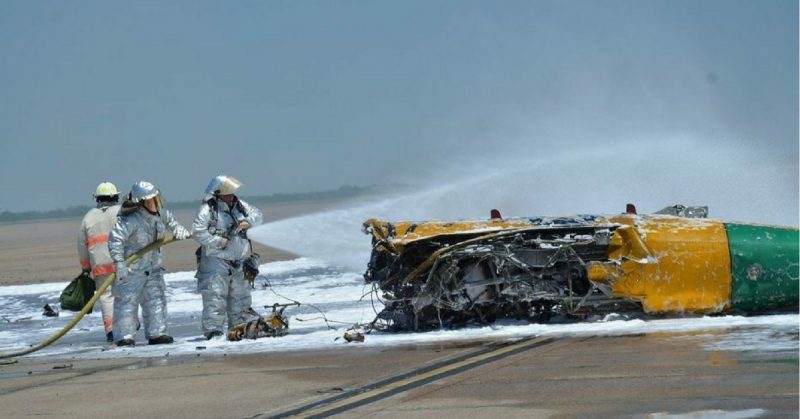 A T-6 Texan single-engine fighter plane crashed after takeoff from Naval Air Station Kingsville in southern Texas on Wednesday. The privately owned World War II-era plane was carrying the pilot and one passenger when it crashed just after noon. The identities of the two casualties were not immediately released while the families were being contacted. It is believed that they were visiting an employee of the airfield. The yellow and green training airplane crashed almost immediately after takeoff according to a spokesperson for the station, Kevin Clarke. Navy personnel were able to extinguish the flames with foam. A witness reported that it appeared the pilot lost control of the aircraft and began to roll back toward the hangars. It is unclear at this time whether the plane experienced a mechanical failure or if the high winds present at the time caused the accident. Other witnesses report that they heard the throttle opening up just before the explosion. Clarke verified that there were no Naval personnel involved in the crash and that there was no damage to the station’s runway or equipment. The North American Aviation T-6 Texan was the plane most Allied aviators learned to fly in during World War II. The US Navy referred to it as the SNJ, and the British Royal Air Force designated it the Harvard. Originally known as the AT-6 before being shortened to the T-6 in 1948, the plane was designed to be an advanced trainer, transitioning between the basic trainers and the tactical aircraft used in combat. Several hundred thousand pilots were trained in the T-6 in 34 countries over 25 years. Over 15,000 of the planes were manufactured. Mostly remembered as a training aircraft, it received honors for its performance in both WWII and the Korean War. North American Aviation took their basic combat trainer aircraft, the BC-1, and modified it to meet the need for a more advanced trainer. The T-6 was slower than combat planes but was easier to maintain and repair, easier to maneuver and easier to handle. It was able to roll, Immelman, loop, spin, snap and vertical roll. The design of the T-6 allowed it to be used in all types of training from ground strafing to bombardment and dogfighting. It could be outfitted with just about every type of weapon used on combat aircraft, including bomb racks, cameras, and fixed and flexible guns. The single-engine plane has a wingspan of 42 feet ¼ inch and a length of 28 feet 11 7/8 inches. It is powered by a Pratt & Whitney Wasp R-1340-AN-1 550hp air-cooled engine with a controllable pitch propeller. The original order for the AT-6 was a mere 94 planes. 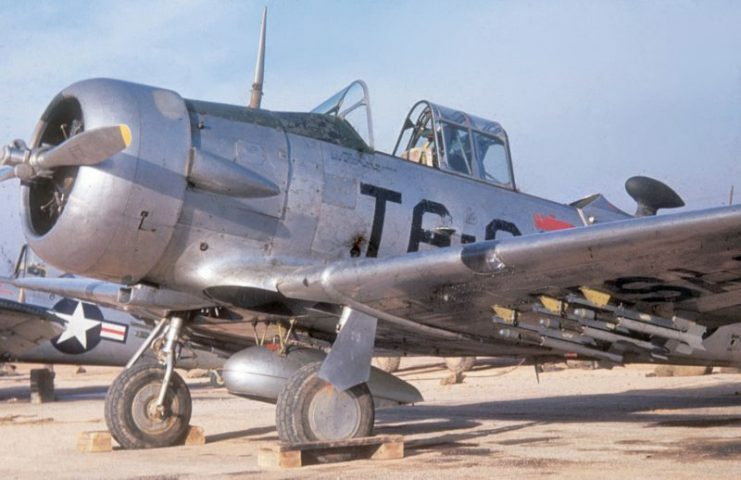 The AT-6A made improvements to the fuel tanks while the AT-6D and AT-6F used alloys to both strengthen and lighten the frames. The US Navy required pilots to log 75 hours of flight time in the T-6 which they designated the SNJ-4, SNJ-5, and SNJ-6. British RAF pilots also trained in the T-6 which they named the Harvard Mk I, Harvard Mk II and Harvard Mk III. The Canadian Car and Foundry company took the T-6 design in 1946 and produced 285 planes they called the Harvard Mk IV for the USAF Mutual Aid Program. 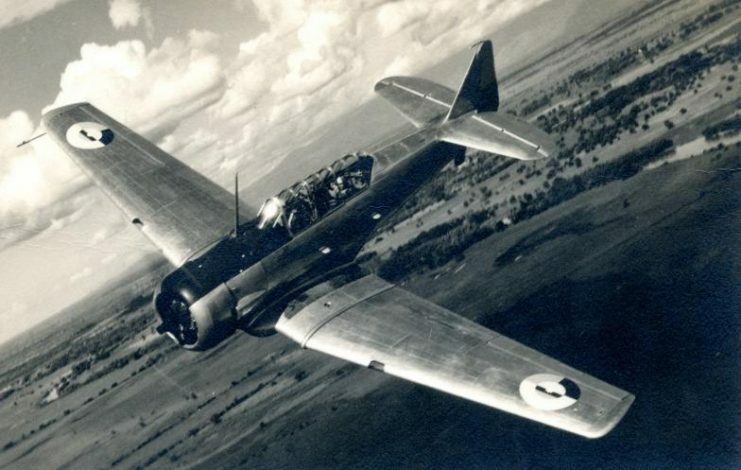 It was designated the T-6G by the air force and is recognizable by the improvements to the fuel capacity, cockpit layout, and a new steerable tailwheel. In all, over 17,000 planes were produced based on the T-6 basic design. 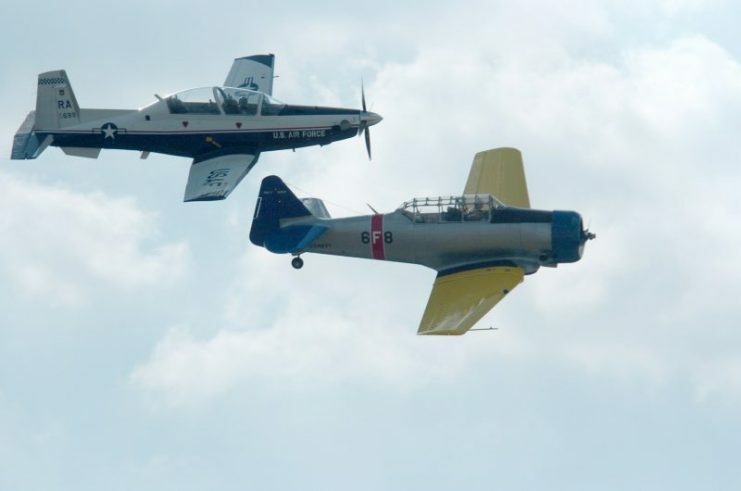 The T-6 was retired from active duty in the US by the close of the 1950s. Several nations, however, still used the T-6 as their basic trainer into the 1970s. Today, there are an estimated 350 T-6 Texans still in airworthy condition.